iCareAll PDF Converter is an easy-to-use PDF converting program that can help you convert PDF to Word, PPT, Excel, text documents, HTML, images and other files. Also allows to change the files of various formats back to PDF with ease and high efficiency. Hence, if you or your friends around really need such software, give iCareAll PDF Converter a try. 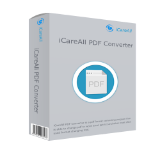 To meet the needs of different users all over the world, iCareAll PDF Converter is designed and developed with lots of useful features. Convert files with fast speed and simple three clicks. Change PDF to any file format and any to PDF with high quality. Process more than 1000 files with its batch mode at a time. Merge or cut PDF files with ease. Support all Word, PDF, PPT, Excel, Image, Text, HTML and more file formats. In conclusion, iCareAll PDF Converter is really a worthwhile program for you to do PDF conversion smoothly.